Free Stuff at JCPenney! 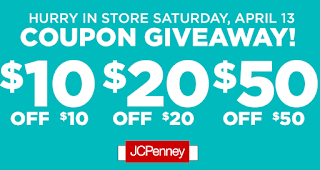 JCPenney In-Store Coupon Giveaway On Saturday April 13th: Everybody Gets a $10 off $10 Coupon, $20 Off or $50 off Coupon for Free Stuff! Free Stuff at JCPenney! 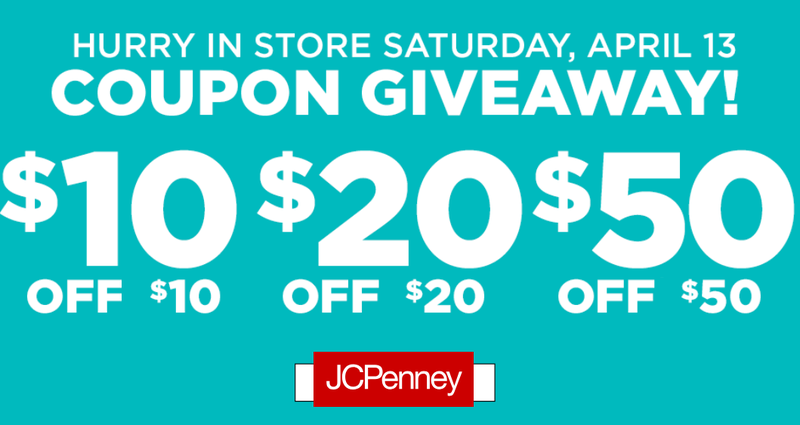 JCPenney In-Store Coupon Giveaway On Saturday April 13th: Everybody Gets a $10 off $10 Coupon, $20 Off or $50 off Coupon for Free Stuff! Starts In-Store when your store opens. Get there early before they run out of coupons. Limit one per person. No Purchase Required! Use it to get $10, $20 or $50 of stuff for free.